1 Free Butterfinger Singles Candy Bar (1.9 oz.) in Kroger stores, with coupon. This Kroger Free Friday Coupon is available for download on Friday, March 22, 2019 but you have until April 7, 2019 to redeem it. What is Butterfinger Singles Candy Bar? Butterfinger Singles Candy Bar is a peanut – buttery candy bar ready to mix your tastes in a yummy experience. The chocolate coat keeps the crunchety texture hidden until you get the first bite and then everything changes til you can’t get enough. Ingredients: Sugar, Corn Syrup, Ground Roasted Peanuts, Partially Hydrogenated Palm Kernel Oil, Cocoa, Molasses, Confectioner’s Corn Flakes, Skim Milk, Whey, Salt, Monoglycerides, Soy Lecithin, Cornstarch, Artificial Flavors, Yellow 5, Tbhq and Citric Acid (Added to Preserve Freshness), Red 40. 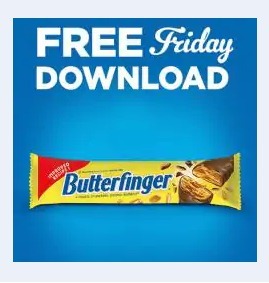 Redeem your coupon in-store within 2 weeks for 1 free Butterfinger Singles Candy Bar (1.9 oz.). Your coupon will automatically be applied at checkout when you use your Shopper’s Card. Available in most stores.